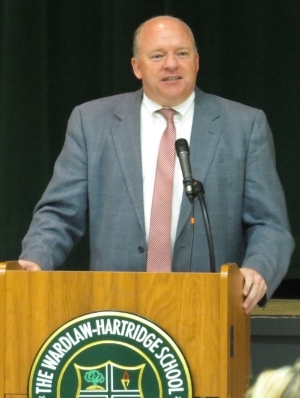 Wardlaw + Hartridge today is a school with an honored past that looks forward to a vital future. In some ways, we are not a typical independent school. We fly the flags of literally dozens of nations that represent the recent ancestry of our diverse student body. The student art that enlivens all of our hallways is rich with these multiple influences and traditions. We are committed to integrating technology, world languages and the arts into our liberal arts curriculum beginning with our youngest students. Our teachers routinely ask our students to pull ideas from multiple disciplines, and to express these ideas clearly in writing and in public speech. At the center of the school experience is a vital energy, the spark of connections between students and teachers as they explore the thinkers of the past and present, as they puzzle out how to express themselves on paper, on canvas or on the stage, and as they work together to form teams that call forth the best that each individual has to offer. Whether you are a prospective student or a graduate, you will find a place that will excite your imagination. If you are a parent, you will find a school that welcomes a strong partnership with you. In some ways, though, the school is the same as it ever was. The best reason for attending Wardlaw + Hartridge is still for the quality of relationships you build with teachers and peers. Our students are deeply engaged with their own learning, guided by dedicated and artful teachers. While they are acquiring skills demanded by universities, they are also learning profound lessons about themselves and how they wish to conduct themselves in the world. After spending most of my life in education, I still find no work more exciting than helping students make this exploration in an intentional and meaningful way. Click link below to read my blog.